A fruit vendor was robbed and brutally beaten while getting ready to sell in South Los Angeles Sunday morning, his stepson told KTLA. Two cars pulled up up to the victim, Pedro Daniel Reyes, and six to seven people who got out demanded money from him and other vendors, according to a GoFundMe page set up by the stepson. Authorities are hoping to get surveillance footage from a nearby business that captures the crime and potentially reveals more details, such as a view of the car involved, according to Lt. David Krumer of the Los Angeles Police Department. Reyes gave the robbers his money, “but they still brutally beat him,” the GoFundMe page states. 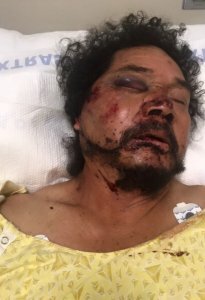 The page indicates that the incident occurred in downtown, but it was in South L.A.
Reyes’ face was fractured, his jaw was broken, his throat was cut and several of his teeth were knocked out, his stepson said. He is expected to undergo surgery on Monday. Krumer said the suspects are believed to be five to six African-American men and one African-American woman. He also said two others were injured in the attack, though not as seriously as Reyes. Reyes, a 54-year-old Oaxaca native, works seven days a week as a roofer and as a peanut and fruit vendor on Sundays, but doesn’t have medical insurance. His recovery could take up to six months and he may have to be fed through a straw after his jaw is shut. The stepson, who did not want to be identified, told KTLA that Reyes has no days off work. The GoFundMe page surpassed its $5,000 goal since it was posted Sunday afternoon, so the goal was increased to $15,000, then The goal was then $25,000 when it kept being met. From his hospital bed, Reyes said in Spanish that he was thankful for the people who have donated, saying they have “good hearts,” a video provided by his stepson showed.